mStock covers all the main asset management processes happening in a regular warehouse. Application consists of 11 scenarios including a small physical asset inventory tool, or asset commission. By establishing the smallest commissioned particle, you set a measure for mStock to keep track of your directories, stocks, components, batches and finalized products as well as their expiration dates and other context information. mStock was the first Mobile scenario we ever implemented, and ever since that, it has undergone multiple succesfull implementations. 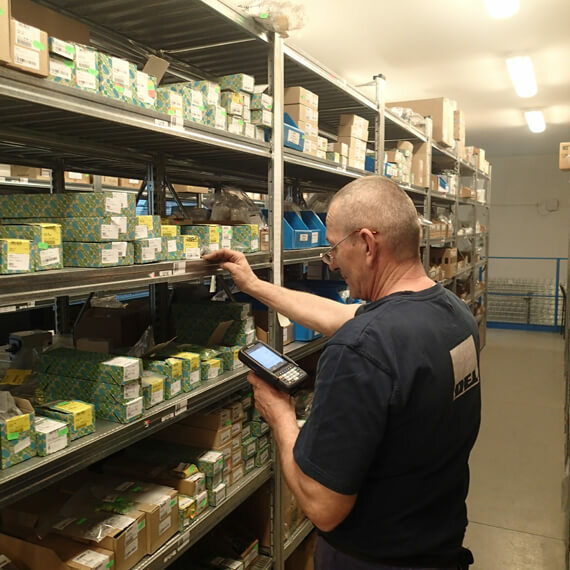 When reading the batch code of a physical storage unit, the operator obtains up-to-date information on the inventory balance in the warehouse. The label can be printed repeatedly. We have solved bin-to-bin transfers in an intuitive manner. The warehouse operator has an efficient tool available for accurate inventory management in individual storage bins. Our solution also displays well structured and coloured information based on the physical structure of shelves and aisles. When entering the material number, the operator obtains up-to-date information on batches in the warehouse and their location. This two-step stock transfer is divided between two user roles, which are defined by their assigned warehouse numbers. The function can be used generically for ad-hoc stock transfers. By reading the barcode of a production or maintenance order, consumption of material can be recorded for the particular order. The operator has a worklist of orders available. He/she can either use the component list or directly read the barcode. The system identifies the batch and the material and records its consumption automatically. The consumption is conditional on logging into the shop floor warehouse. The mobile pick list is a simple list of reservations in the form of requests for indirect material, such as office supplies, work clothes, etc. The warehouse operator picks them continually and confirms his/her actions directly from the mobile device anywhere in the warehouse area. Using the mobile application and the mobile device, a pick list is created for picking of material for production by warehouse operators. This “PP staging” is based on the source data of production orders in SAP, and the pick list directly reflects open and confirmed quantities of components. This robust solution is highly intuitive and the operator is constantly informed about the items to be staged or already staged for the particular production order.This way we provide clear and structured information in the mobile device, which is commonly displayed across several different transactions in SAP. Normally the user needs to run the transaction COOIS, possibly also MF60, in order to obtain the required information, and its interpreting usually requires training. Moreover, individual reports between MM and PP or WM and PP – “pull lists” or “pick lists” – are “dead reports” from the moment they are created. Our mobile application provides all this information interactively. Several scenarios have been prepared for the purpose of shipping. A separate mobile tool has been created for staging of outbound delivery. The process begins on the level of inventory management, where the warehouse operators (in warehouses of production materials and assembly materials) have information available on the shipping worklist and use their mobile device to transfer the materials to shipping. The shipping operators – pickers – can take over the worklist to their mobile devices and carry out the picking activities for the particular delivery. In the background the picking quantity and the status of the delivery is updated in SAP. This scenario supports physical inventory on the level of an MM storage location with extended storage bin management on the level of batch classification. Mobile devices contain worklists which are divided based on the physical layout of the warehouse and each operator is assigned to a defined part of the warehouse. Functions of counting, re-counting and displaying of inventory balance in storage bin are available.